His break-through came in the series Triumph in the Skies , and despite the criticisms and rumors circulating Hong Kong tabloids, Ron has won himself a large fan-base in Hong Kong through this appearance. He was one of the four TVB actors selected to be the spokespeople of the 2006 World Cup. Besides Ron, the three chosen ones were Raymond Lam, Kevin Cheng and Bosco Wong. Raymond Lam is a Hong Kong actor and singer who has acted roles in the television dramas A Step into the Past, Moonlight Resonance, Highs and Lows and Line Walker and was dubbed the King of Chok after his role in The Mysteries of Love. He acted in several series on the mainland, leading to a high demand for him on the mainland. He featured and led in several popular series on the mainland, such as Chocolate Lovers , Life and Death , Pretty Maid . Niki Chow is a Hong Kong actress and singer. 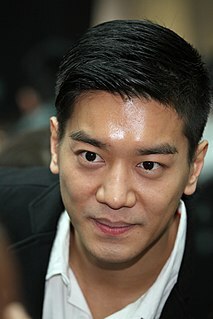 Sammul Chan Kin-fung is a British Hong Kong, actor, singer, and presenter. Kenneth Ma Kwok-ming is a Hong Kong actor. He speaks Cantonese, Mandarin and English. Ma is currently under the management of TVB. Lai Lok-yi is an actor from TVB, Hong Kong. His real name is Lai Yat Sing and his English name is Chris Lai, better known by his stage name Lai Lok-yi. He is favorited by his numerous starring roles in a string of TVB 's dramas, especially Hearts of Fencing, Who Wants A Baby and sitcom drama Come Home Love. Wong He, sometimes credited as Wong Hei, is a Hong Kong actor, singer, and presenter. He is best known for his firefighter roles in TVB's Burning Flame trilogy. As a former police officer, Wong has acted primarily in law enforcement roles during his career at TVB, which gave rise to rumours that his stage name is based on the Cantonese term "皇氣", a slang term for the Royal Hong Kong Police. Wong is a practising Buddhist, having converted in 2000. Michael Tse Tin-wah is a Hong Kong actor. Wayne Lai Yiu-cheung is a Hong Kong TVB actor. Where the Legend Begins is a 2002 Hong Kong television series produced by TVB. The series is based on the life story of Zhen Fu, a noble lady who lived during the Three Kingdoms period. It contains embellishments from folktales about Yan's romance with Cao Pi and Cao Zhi. The series was first aired in Hong Kong on TVB Jade from 24 June to 26 July in 2002. Ruco Chan Chin-pang is a Hong Kong actor and singer. He made his acting debut when he was seventeen years old, appearing in an episode of the TVB television drama Instinct (1994). After years of playing background and minor supporting characters, Chan got his first major role in the ATV television drama Love In a Miracle (2003). Though he continued to star in ATV television dramas for the next three years, his drama series were not commercially successful. When Heaven Burns is a 2011 Hong Kong television serial produced by TVB and starring Bowie Lam, Moses Chan, Charmaine Sheh, Maggie Shiu and Kenny Wong. First revealed during TVB's Sales Presentation 2009 in 2008, filming took place in late 2009 to early 2010, with the first episode airing both in Hong Kong and TVB's overseas affiliates and partners on 21 November 2011. On 27 December 2011, the show was blacklisted by the Chinese State Administration of Radio, Film, and Television, making it the first Hong Kong television drama to be censored in Mainland China in more than two decades. Witness Insecurity (護花危情) is a modern TV drama produced by TVB and starring Bosco Wong and Linda Chung. The series was originally announced to be a spin-off of the 2011 series Yes, Sir. Sorry, Sir! featuring the popular character "Miss Cool" portrayed by Chung. A costume fitting press conference was held on 21 November 2011 at Tseung Kwan O TVB City Studio One Common Room at 12:30PM. Triumph in the Skies II is television drama produced by TVB under executive producer Tommy Leung. It is a sequel to TVB's 2003 blockbuster television drama Triumph in the Skies. It stars Francis Ng, Julian Cheung, Myolie Wu, Fala Chen, Ron Ng, Kenneth Ma, Nancy Wu, Elena Kong & Him Law. Line Walker is a 2014 Hong Kong crime thriller drama produced by TVB, starring Michael Miu, Charmaine Sheh, Raymond Lam as the main leads, with Sharon Chan, Benz Hui, Elena Kong, Sammy Sum, Oscar Leung and Toby Leung in supporting roles. ↑ "Drug InfoCentre combats drug abuse". website. news.gov.hk. 21 June 2004. Archived from the original on 25 June 2004. Retrieved 20 March 2010.